Kelowna locals love the water. When they&apos;re not in it, they&apos;re on it. And when they&apos;re not on it, they&apos;re looking at it - jealous of those who are enjoying its cooling touch and plotting a quick return in their beachwear. Contrary to how it might appear, not everyone in Kelowna owns a sailboat, a pair of jet skis or has paddleboards strapped to the roofs of their vehicles. They do, however, know where to go if they want to secure a boat for a day or rent a paddleboard or kayak for an early-evening sojourn. They know the best beaches, where to get away for a family swim or picnic and where to drop anchor to do a little fishing. Here are some of the best places for Kelowna watersports and rentals, straight from a Kelowna local. Kelowna’s waterfront gateway is ideally located in its downtown core, where you can find rentals and temporary moorage at the Downtown Marina. Lunch, shopping and many other attractions and activities are literally just steps away. A gas bar and rentals are also available if you’d like to try your hand at skimming the waves aboard a stand up paddle board, jet ski, surf board, wake board or tube. Bringing your own boat? Additional boat launches, offering fuel services and other amenities, are located along the Okanagan lakeshore in Kelowna, West Kelowna and Peachland. If you’re planning an extended trip, you’ll also find launch facilities and moorage in Vernon to the north and Summerland and Penticton to the south. Okanagan Rent-A-Boat, based out of the Delta Grand downtown, offers the use of patio boats, powerboats and jet skis—accompanied by temporary proof of operator competency. You can rent skis, wakeboards and tubes to create a little more family fun. Kayaks and canoes are also available if you’d prefer to create your own energy. The Eldorado Marina, located at the Hotel Eldorado, boasts the Okanagan’s largest exclusive fleet of Mastercraft tournament boats and Waverunner rentals. The full-service marina provides daily and weekly moorage for guests. You’ll find windsurfing and parasailing adventures nearby. Looking to fly high above the water? 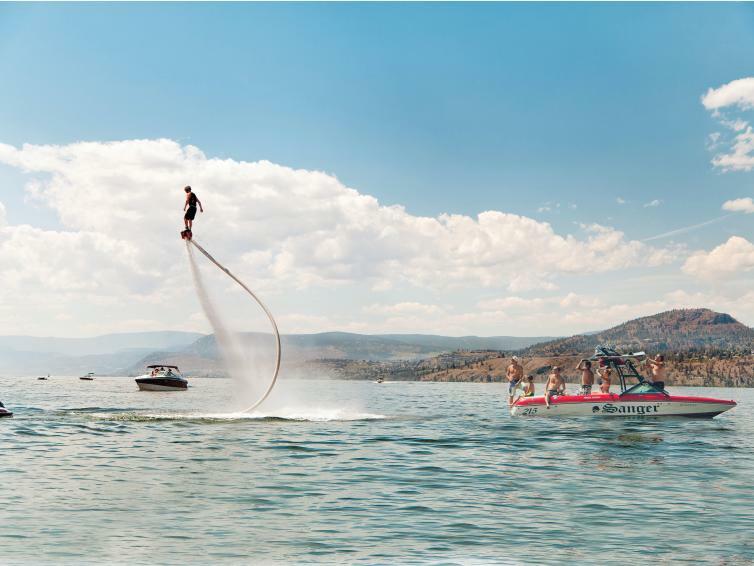 Check out Okanagan Flyboard for an adrenaline kick. New to the sailing experience? Leave the ropes and charts to Captain Al and First Mate Jo-Ann at Go With The Wind and just settle back to enjoy the cool breeze and gentle swells. Aboard a 26-foot MacGregor sailboat, you can capture a new perspective of Kelowna’s downtown or make the day a little more adventurous with an extended sail north or south. Cruises are inexpensive, entertaining and can accommodate up to five people—perfect for a bachelorette party or guys’ weekend. If you’d rather be in the water instead of on it, visit one of the many Kelowna-area beaches offering sand, sun and gentle waves. 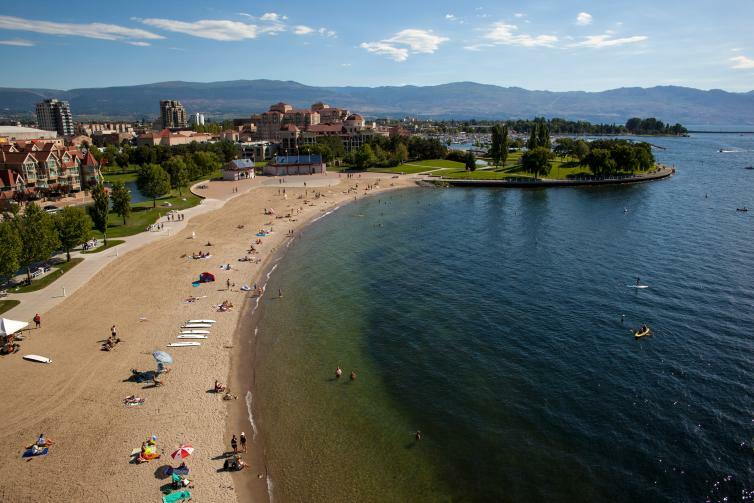 In Kelowna proper, you’ll find eight beaches with change facilities and other amenities. Build a sand castle, stretch out on a blanket and just soak up the warmth then cool off with a refreshing dip. Favourites include Rotary Beach & Bertram Park for families and Gyro & Hot Sands Beaches for the younger crowd. 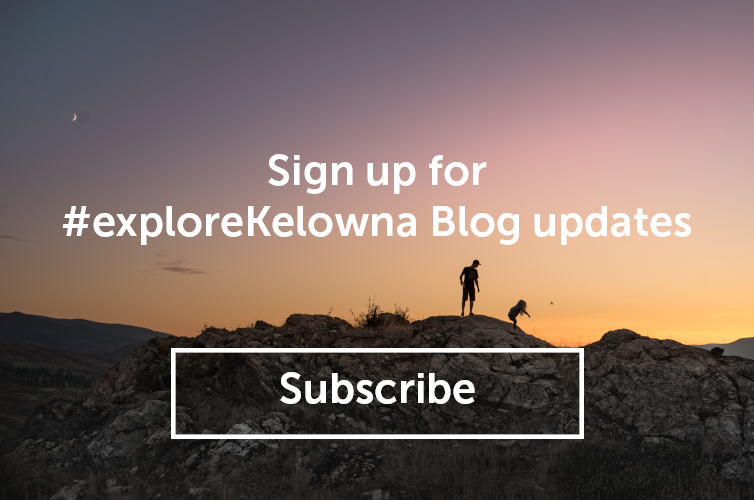 Check out insider perspective on Instagram with #explorekelowna to find more amazing public-access beaches that are off the beaten path. If you have access to a watercraft, skip across to the east end of the lake, just south of Kelowna, and visit Okanagan Mountain, Provincial Park. Largely inaccessible except by water, the park is a boater’s paradise, offering marine campgrounds and secluded bays and beaches. If you’re an angler, you’ll love Kelowna’s central location. Go in any direction and you’ll find yet another lake and a fishing opportunity. Drop a line and try your skill and luck at hooking rainbow trout, Kokanee salmon, whitefish and burbot. If you’d rather leave the driving (and fish finding) up to someone else, hook up with Desert Salmon Fishing Charters who offer memorable guided outings on Okanagan Lake.